The original cheque used to buy the Superman comic character from its creators Jerome Siegel and Joe Shuster has been sold in an online auction for $160,000. 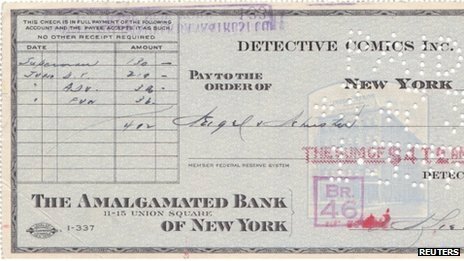 Jerome Siegel and Joe Shuster from Cleveland were paid $130 for all the rights to Superman by Detective Comics, later known as DC Comics. ComicConnect told Reuters that when the first Superman movie came out in 1978, Joe Shuster was so poor he was working for a delivery company. Although $130 is around $2,300 in today’s money, it is a tiny fraction of what the character has earned since then. ComicConnect says the cheque was used in a court case in the 1970s, the last time Jerome Siegel and Joe Shuster themselves tried to get the rights to Superman. After their victory a DC Comics employee was told to throw away the court papers, but he held on to the cheque, recognizing its significance.